The famous Blue Lagoon, between Krknjaši and Drvenik islands, Croatia (photo: Quentin Long). The pretty village of Seget Vranjica, Croatia (photo: Quentin Long). The striking blue of the Adriatic (photo: Quentin Long). 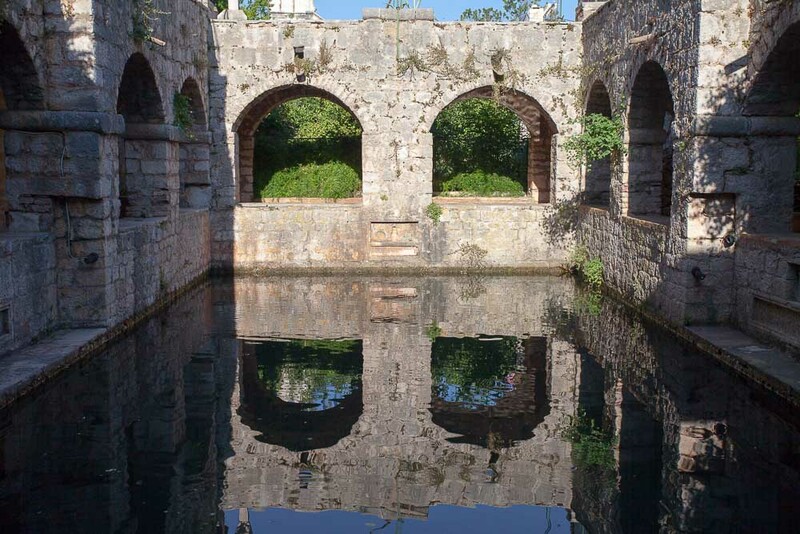 The fish pond in the courtyard of Petar Hektorović’s Stari Grad ‘fortress’ (photo: Quentin Long). The lush Croatian coast (photo: Quentin Long). 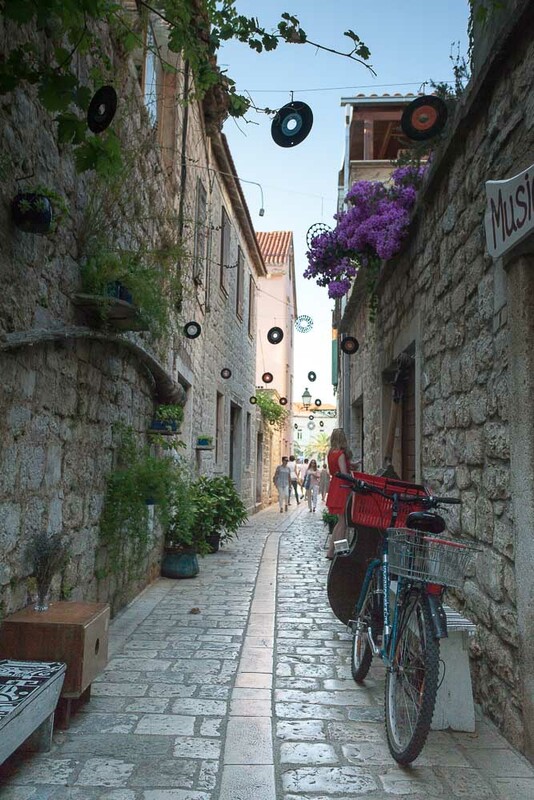 The old streets of Stari Grad, Croatia (photo: Quentin Long). 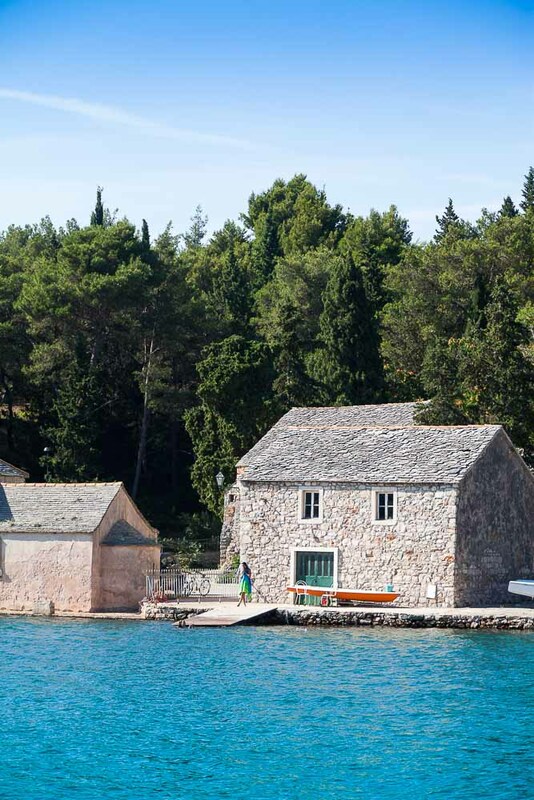 An old boathouse in Stari Grad harbour (photo: Quentin Long). A crewman secures the yacht (photo: Quentin Long). 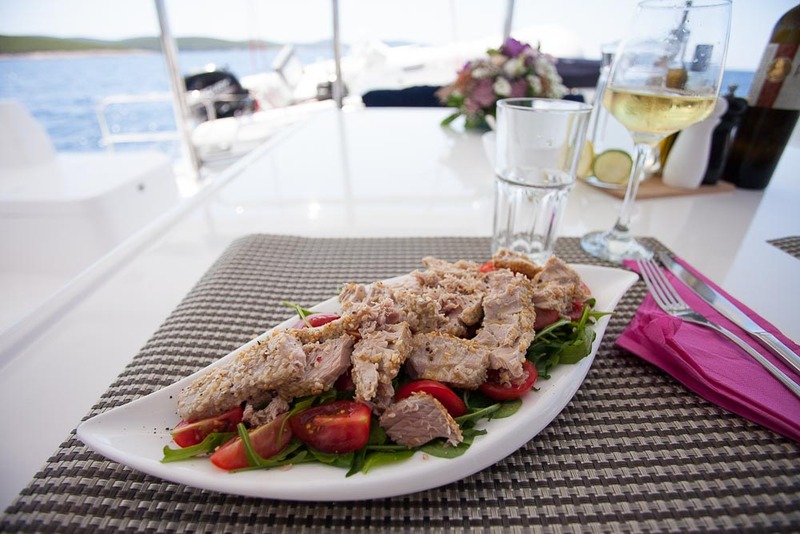 A lovely tuna and rocket salad courtesy of Sdjana (photo: Quentin Long). Anchored just off Krknjaši Island in a lagoon of iridescent blue, on a private yacht complete with skipper and host to look after just my wife and myself, I suddenly fall into a self-indulgent mild depression. Our journey has been underway for only three hours and I’m overwhelmed with regret… everything is just too perfect. 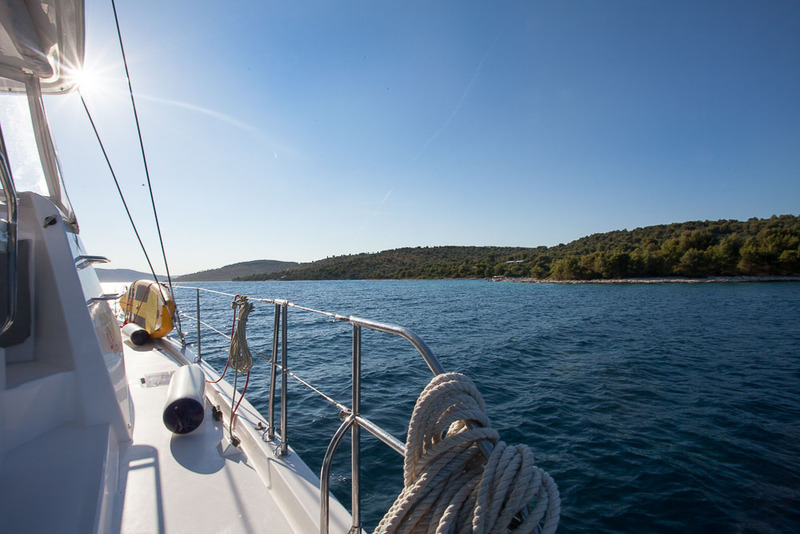 Earlier that day we had sailed out through Marina harbour, an hour north of Split Airport, under a cloudless sky. We had sat trance-like, mesmerised by the Croatian coastline; the landscape tends towards the rocky, bare and beige, interrupted by the occasional green slash of a vineyard and worn stone house on the water’s edge. In the distance we saw a few sailing boats contrasted against the wide brilliant blue of the Adriatic. The warm winds gently massaged the tension out of our muscles as we started to decompress. Sdjana, our host, served us breakfast onboard, a feast of freshly squeezed juice, coffee, tea, eggs, bacon, bufala, yoghurt and fruit salad. It was simple but greatly appreciated given we didn’t have to cook it ourselves, convince a child to eat it and then wipe it off the floor while avoiding getting it on our work clothes. We gazed out to sea, barely speaking, and soaked up the soothing quiet; we were returning to the people we were BC (before children). Two hours passed in this way before we dropped anchor between Krknjaši and Drvenik islands in what is famously known as the Blue Lagoon, the water so clear we could see the sandy sea floor below. After half-an-hour of soaking in the brilliant blue, it was back on board for morning tea. That’s when that overwhelming sense of regret swamped me. We are only doing this for two days. Two days! That’s only another 40 hours or so of meditative, restful bliss. I had tried to convince my wife that we should spend a week cruising Croatia, but shopping in Paris and sightseeing in Rome were deemed higher priorities. Shaking off my reverie, I decide instead to soak it all up while it lasts and the next day and a half is spent exploring isolated coves, each one more spectacular than the last. 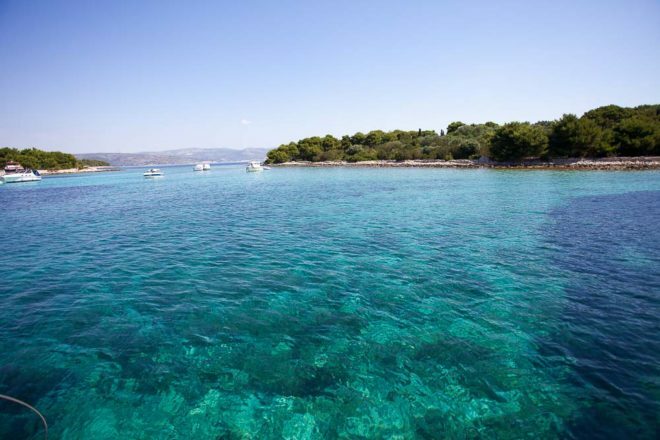 Croatia’s water is liquid crystal, with the beating sun creating a magical ’70s disco effect of twinkles and sparkles on its surface. Lunch is served in one such cove – a feast of lightly seared tuna covered in sesame seeds with a salad of rocket and juicy, sweet cherry tomatoes. Sdjana matches it with an unusual local white wine, Lipanović Vugava. Only found on the nearby island of Vis, the Vugava variety is believed to have been cultivated there for more than 2000 years. Sjdana makes a great gin and tonic too, and we sip them as we pull into our evening berth at Stari Grad, a tranquil ancient town on the northern side of Hvar Island. Tonke, our skipper, knows the harbour master well and has secured a perfect berth in the heart of the harbour. From here we amble around the old town admiring the buildings of local white-yellow stone and wend our way down to the pretty main square. This is where one of Croatia’s favourite literary sons, Petar Hektorović, built his ‘fortress’ and penned the seminal poem from which the official Croatian language was born. The fortress is more like a noble house, the highlight of which is a sea-fed fishpond in the centre of the courtyard. We stroll under the pretty arched walkway that rims the courtyard, like a cloister in miniature. 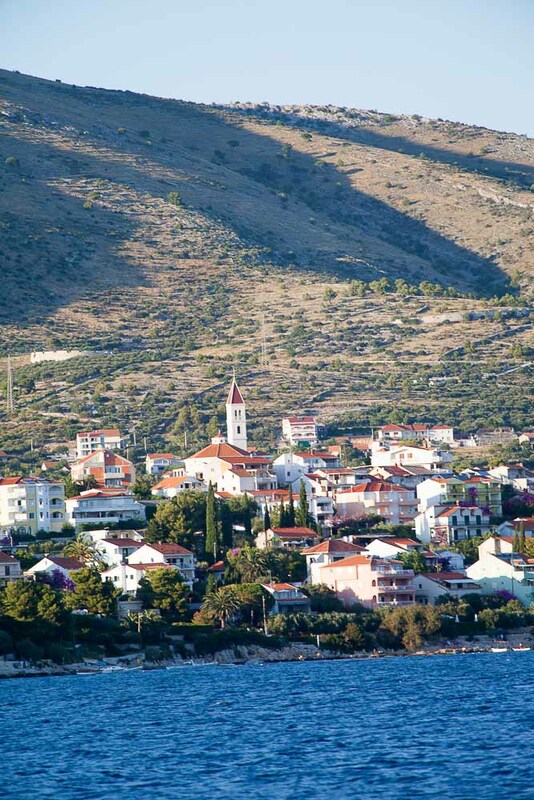 On the outskirts of town is the UNESCO World Heritage-listed Stari Grad Plain. Continuously cultivated since the 4th century BC, it is the best preserved example of the Ancient Greek practice of the systematic parcelling of land by building stone walls. With our explorations at an end, we board the boat for a much needed pre-dinner drink. As the sun sets more and more boats fill the harbour, the waterfront swells with fellow explorers enjoying drinks and a meal at one of the local bars. On board, Sdjana serves up grilled zucchini and eggplant followed by pumpkin soup and grilled prawns. She matches it all with another surprising local wine, Rak Babić. The red babić grape creates a rich, luscious wine not for the fainthearted. Waking the next day the wind has picked up, making sailing back towards Marina a breeze. The day follows the same script: swim, snack, swim, snooze, eat and drink, repeat. We disembark at Marina different people to those who boarded here a mere 48 hours before. We remember who we were BC, and why we liked each other in the first place. We’ve also come to terms with our regret. The beauty of travel is that these things are easily corrected: we will be back (for at least a week) in the very near future. Getting there: The closest airport to Marina is Split and The Moorings will organise a transfer to and from the airport. Playing there: A seven-night, all-inclusive charter of a Moorings 4800 (the yacht we chartered) starts from $14,840 for up to six guests. A range of smaller and larger yachts are available. 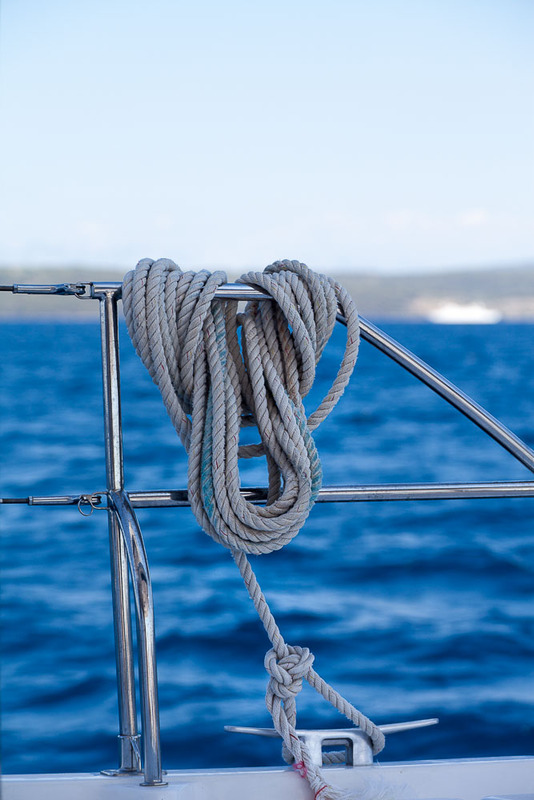 The Moorings offer skippered charters from 25 destinations across the world.